Your members are the heart and soul of your organization. Whether you are an association, an advocacy group, a foundation, a healthcare organization, or any type of changemaker group, your members are the heart and soul of your organization and nurturing those relationships fosters deeper, more meaningful levels of member engagement. Our Social Networking App provides your members with an authentic social experience that is focused on connections, education, discussions and shared experiences, where members interact and drive conversation, participate in activity they can't find on general social networks, and receive acknowledgment. 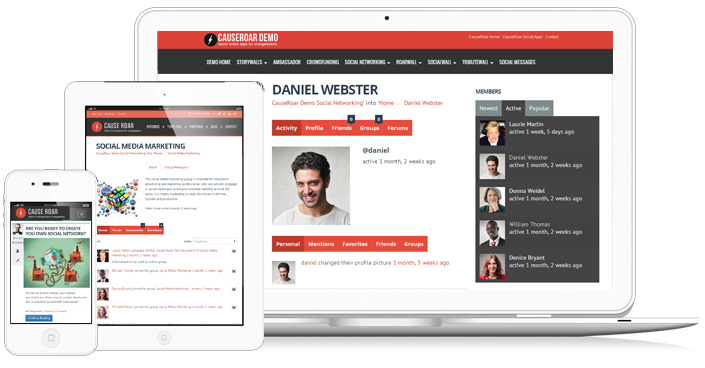 Unlike public social networks, CauseRoar’s members only social networks are used for creating a private online community where discussions, member directories and all content is secure. When your supporters use the CauseRoar Social Action Apps, they are taken to a Thank You page and receive an email that asks for their donation to support your cause. Each action your supporter takes is tied to an ask! Each step of the way, supporters are asked to share their actions on social networking sites using pre-written messages by your organization and tell-a-friend emails to enable your supporters to get their friends and family involved. Cutting-edge coding optimizes websites for desktops and provides "app-like" experiences on smartphones, and tablets. Training is provided, so that your staff can quickly manage your supporters' social actions through a back-end admin interface.